Josephine 2 has come into season for the second time since being in Oregon. Luther and Julie have made a conserted effort to keep the two girls happy and comfortable. 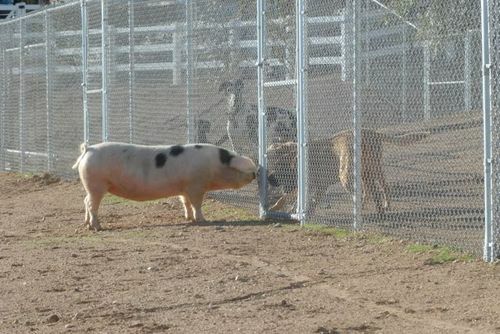 They have made an area for them away from the other pigs on the farm and have made a set up so that Dancer, the boar, can go in with Josephine 2 and Josephine 1 is still in the same pen but separated from them. This was done to keep the stress levels very low as these two sisters have been together their entire lives. Josephine 1 still has not come into season so she has been started on hormone therapy. One of the best pig vets on the west coast is monitoring the breeding project very closely and the top pig vet on the the east coast is also being consulted. We are very hopeful that we will have a litter or two from these 2 Josephines. Josephine 1 & 2 and Dancer having breakfast "together"
Both of the girls are doing great!!!! The repro vet has been out to see them and she was pleased with the condition of the girls - minus there long feet..... I don't have a sqeeze chute so toe trimming is pretty tough here. Dancer the boar was moved into a pen inside where the girls live. He was put in a separate pen so they can be introduced gradually. They can touch noses and get used to eachother safely before we introduce them "officially". The girls made it safe and sound to their new digs in Oregon!!! We will give them a little while to settle in and they have an apointment with a pig repro vet tomorrow. Hopefully she will give us a better idea of when we can introduce them to the boar. 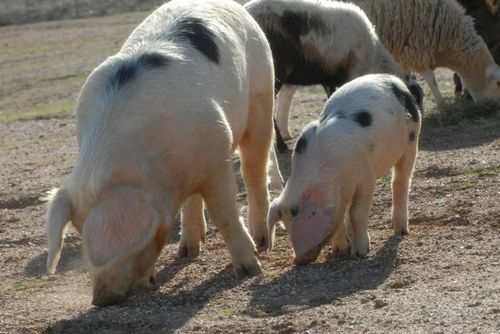 As I was cruising around the web I saw a photo of spotted piglets!!! OMG!!!! They were the flipping cutest things I have EVER seen!!!! Turns out they are Glouscestershire Old Spots and there are only about 1000 here in the US!!! 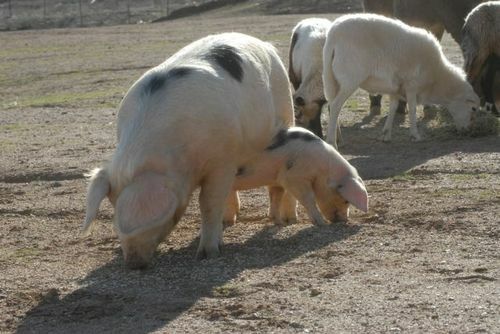 Photos of GOS Piglets from the GOSA site. 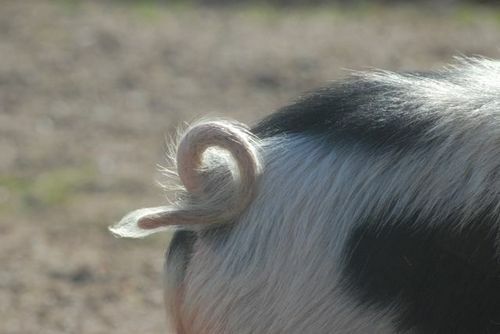 I somehow found the name of a GOS breeder in Oregon and had 2 gilts shipped to me. ADORABLE!!!!! They are a very sweet breed and get really huge!!!! Since I am a breeder at heart I knew I had to find a boar for the girls. GOS breeders use a color wheel to figure out what is a best match for their sow because there are so few here and the gene pool is tiny. Each line of pigs belongs to a color group… either Blue, Green, Black or Red. 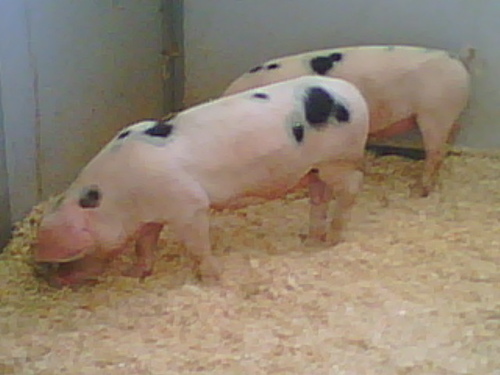 Another interesting thing is all the girl pigs are named after their mother. So my girls are Josephine I and Josephine II. I bought and shipped a black group boar from New York to "hang out " with the girls. 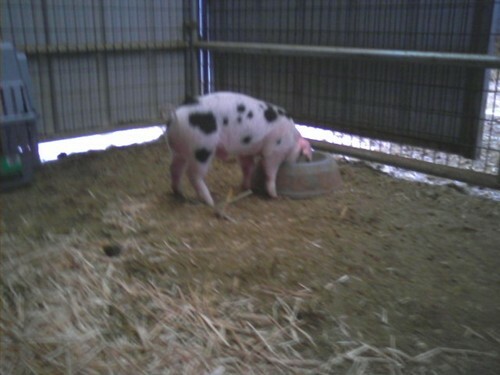 Since my mothers name is Josephine I thought I was being clever and named my new boy pig Andy ( My fathers name ) …. My mom didn't really appreciate the humor in that. Andy was doing great until we found him dead in the stall one morning. I think he was bit by a rattlesnake. All my pig breeding dreams went up in smoke. I am not located in the pig hotbed of the country so as life and other priorities took over my pig breeding days were pretty much over. The girls are getting up there in age and even if I bought another piglet it would take time to get him old enough to breed. While at the Dalmatian National in Kansas a short time after Andy died I saw that there was a GOS breeder not too far from the host hotel!!! I asked a couple of friends if they wanted to go look at pigs with me… They said sure!!! It was fun and ride over to the GOS farm my friends started freaking me out by telling stories about how they had heard of people killing people and throwing the bodies to the pigs and not a trace of evidence would be left!!! Then they started in on that they would ask the farmer " sooo how many pigs would we need for … let's say a 180 pound man" I turned to them and laughed then in a very stern voice " Don't you guys dare say any of that stuff to the farmer, I REALLY want him to sell me a pig!!!!!" So now we are 5 years later after bringing both Josephine's here to our ranch and no boar and no piglets!!! They are my girls and the right thing to do is get them bred….. and continue the Josephine line!!!! I guess me and the girls have been quite the topic in the GOS circle and the cause of some excitement in the US GOS world, and I do think that this Josephine Project is important. I love my girls and would hate to see the Josephine line die off. I was contacted by email by several people in the GOSA club and got a call from a man named Luther. He sounded like a very kind man and was interested in seeing what he could do to help me get these girls bred. He and his wife Julie have a farm in Oregon and have several GOS pigs including 3 GOS boars!!! Turns out he got his original pigs from Rich in NY who I bought Andy from ….. IT really is a small world. With that phone call from Luther & Julie was born " The Josephine Project " There were a few initial obstacles that we had to figure out, first being the 1000 miles that stood between the sows and their boar. Luther and I agreed on a half way point to meet and exchange the girls…. then we ran into the second and third obstacles…. I don't have a trailer and have never actually pulled a trailer. So I got on the phone and spoke with every livestock/horse hauler and friend that had a trailer …. I even toyed with the idea that I could just load them up into our white sprinter and they could ride in the air conditioning all the way to our meeting point. I thought long and hard about that option ….. Daneen probably would not go for it and then there was the tiny detail of how were we going to safely transfer both girls from the sprinter to the trailer???? Visions of two big spotted pigs galloping down the I 5 sent shivers down my spine then chuckles because I could then visualize me running after them yelling "GIRLS come back!!!!" After zero luck finding a hauler or a trailer, Luther decided that it would probably be easier and safer on the girls if he drove all the way here. I agreed. No transfer and less stress all the way around. Boy was I thankful!!! Project Josephine is classified as highly time sensitive. I could hear the girls biological clocks ticking away every second. So the plans were set. We tried to think of every possible think to keep the girls safe and comfortable on their journey. Pigs don't sweat and can overheat very quickly and we have been having record high temps. Luther brought a generator and a huge fan that he could run to keep them cool if he needed to. So today was the big day. I have been telling the girls all about their new adventure for a few days now. Luther drove up with a beautiful huge trailer that was filled with hay, straw and a big pile of shavings that we hosed down so the girls could keep cool. He also brought a bunch of zucchini squash the size that I have never seen before!!!! We divised a makeshift chute from horse corral panels leading from the barn to the trailer. I didn't feed the girls today so they would be super hungry and maybe a little more motivated to load up into the trailer. We got a bucket of feed and had some apples and the monster zucchini in the trailer waiting for them. One of the Josephine's must have got a whiff of the food and hopped right up into the trailer. The other Josephine was not so keen and turned around to go back into the barn. We got her turned around facing the trailer again and she must have heard her sister making smacking sounds as she gobbled the first zucchini. Well that is all it took…. she then hopped right in and we shut the trailer door. Super easy peasy. So with a tears in my eyes and wishing them a safe journey and sending lots of pink and blue thoughts (more pink than blue) for the girls, I watched them travel down our road and heading to a new phase in their lives. The girls finally got to come out and play in the snow. They didn't seem to mind it much. Josephine I & II and little Andy are doing great. They enjoy stretching their legs and soaking up the lovely California s unshine. This is my first attempt to putting video on my blog....not so good. Not too sure how to get the code not to post. Anyway Andy liked his new home until he saw the girls next door...he must think they are his mommy. Poor little guy...First night away from his mum and 9 brothers and sisters. Andy flew in from New York today and was just the sweetest boy i could imagine!! Hopefully in a short while we should be having little piglets here on the ranch!! He is 6 weeks old and already weighs 23 pounds. Andy moments after his first plane ride. Andy in his new home.......taken with a cellphone. We are beyond excited here at the ranch that josephine 2 and 3 made it all the way from Oregon happy and healthy!!!! They are bedded down all snug as bugs in their new home. 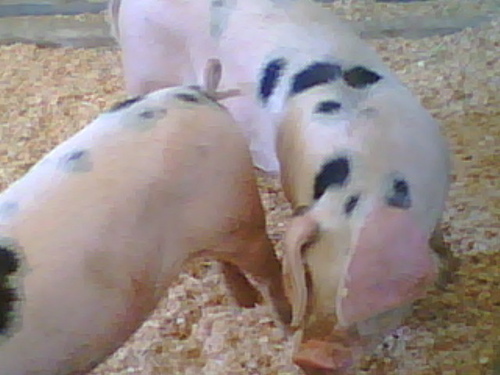 They are both the cutest little pigs ever!!! We bought them when they were about twelve weeks old and I had the hardest time finding trasportation for 2 little piggies....well by the time I found them a ride they just about didn't fit in a size 500 crate!!!!! CUTE, CUTE, CUTE!!!!!!!! These photos were taken on a cellphone....better pics to come.